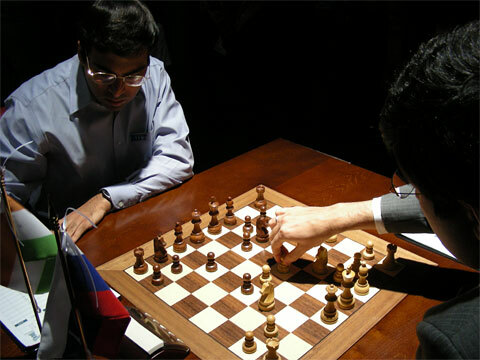 Just ten days until the Anand vs. Kramnik World Chess Championship match of 2008! Tonight I present another preview game for the upcoming World Chess Championship match between Viswanathan Anand and Vladimir Kramnik. The game I chose is a recent example of the two contenders going head to head in a major event. My analysis is above the game that was played at the Corus tournament in 2007. Enjoy! 10…Ra7 Anand starts to mix it up early. 10… Be4 is a lot more natural and common in the Catalan. 16. a3 Kramnik’s invention. This move serves to limit Anand’s bishop on the queen-side. 22…Nc4 Perhaps Anand should have tried 22… Bc4 23. Nxc4 Nxc4 and Anand has a knight to harass Kramnik with. 25…c6 Anand’s pawn had been under attack at c7. However, moving forward allows Kramnik to control the d8 square with his Bishop. 26. Rd1 is real trouble for Anand due to the fact that Kramnik’s Bishop forces Anand to place a rook on d7 rather than d8. 28. Rd1 Now Kramnik controls the d file. 30. f4 Is a very interesting move by Kramnik. 30. Qd4 forms a nice battery on the d file and is what most strong players would play. However, Kramnik must feel he wants his queen leading the charge on the d file. 30… Re6 Anand attempts to punish Kramnik’s last move by forcing his rook to retreat. Even with the retreat, Kramnik will still control the open file. 32. Qd4 Kramnik reveals his intentions of having the queen lead down the d file. 36. e5 Kramnik unleashes his bishop on g2. Another way of activating the bishop would have been moving it to h3. 43. a4 Kramnik delivers a knock-out blow to Anand with his a pawn. This entry was posted on October 4, 2008 at 5:44 am and is filed under Anand vs. Kramnik, World Chess News. You can follow any responses to this entry through the RSS 2.0 feed. You can leave a response, or trackback from your own site.